Today I was part of a panel discussion at the Spektrix conference. 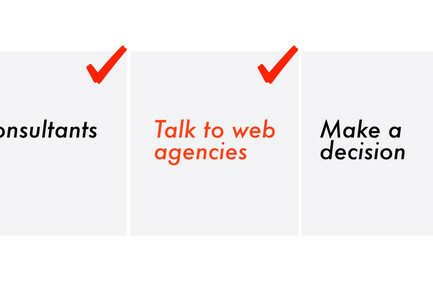 During the session, web agencies spoke about the challenges of communicating an organisation’s offer online, and the tools and approaches they take to give users the best online experience. 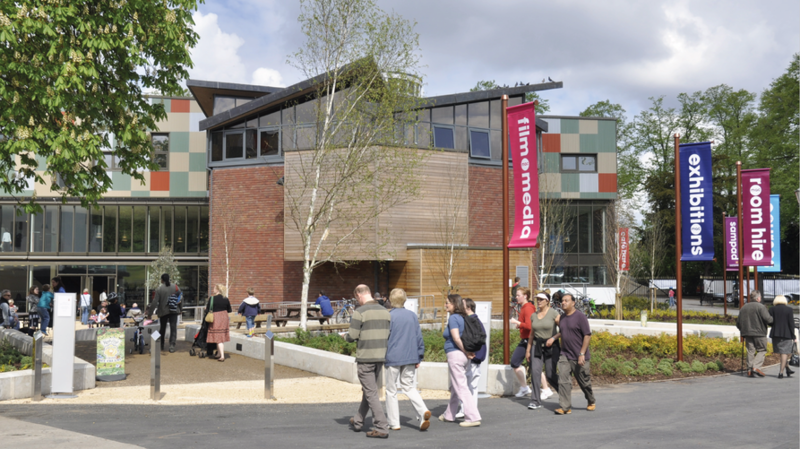 I talked about our work with Midlands Arts Centre – aka MAC – an organisation we’ve been working in partnership with for the past five years. 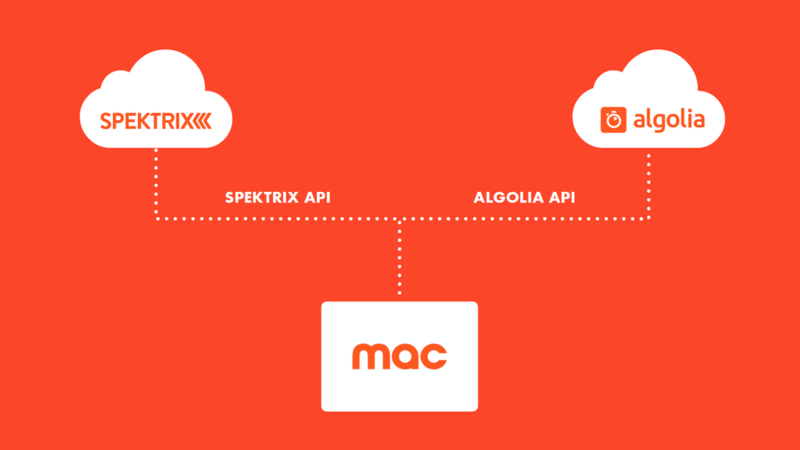 MAC's website was our first Spektrix integration, and it’s fair to say they’re one of the most complex organisations we work with – both in terms of their programme and their website's various integrations. When we started work with them in 2013, our focus for the site was improving core user goals in order to increase transactions. 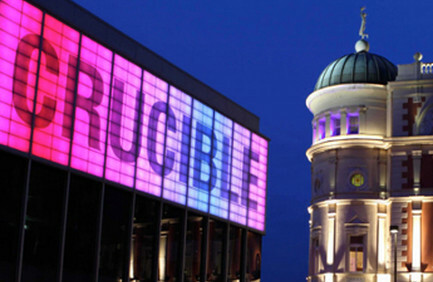 This worked well; there was a 70% increase in online booking within the first 12 months. 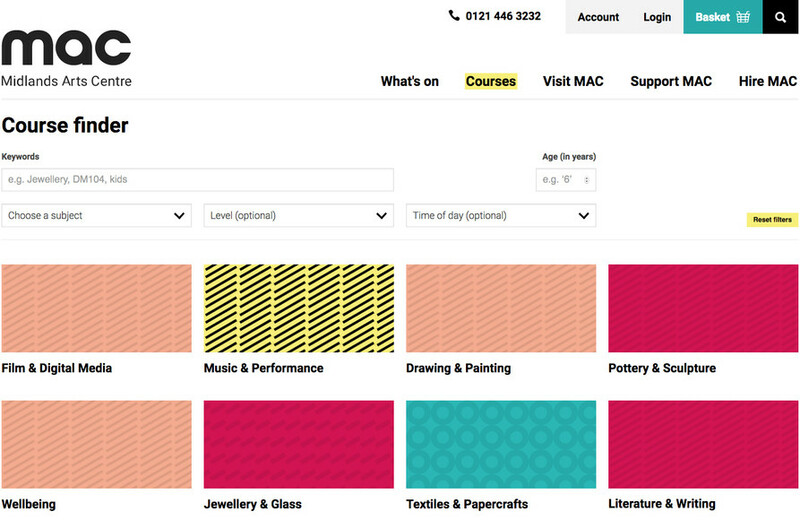 One of the key features of the new site is the course search functionality – the mighty ‘Course finder’. Courses were integrated into the main What’s On calendar listings. Whilst this was okay, it wasn't ideal. The same course could include multiple classes over many weeks but, once the first class was over, the calendar listings weren't relevant to anyone (but possibly that course’s participants if they needed to check a date). So, course instances were cluttering the calendar for everyone else. We used a funnel-like structure for filtering; beginning with people choosing their age bracket, then course term, and ‘level’, which then led through various sub- and sub-sub-categories. This worked fine for anyone who knew what they were looking for, but it wasn’t great for browsing. The problem with both of these setups – they force the user to make decisions in a specific order; an order that’s not especially natural. For the new website, our goal was to improve the user experience by creating the digital equivalent of leafing through a – really well-designed – prospectus. We wanted to make the experience quicker and more intuitive, while accommodating different types of users; people who know exactly what they’re searching for, and those just wanting to browse. 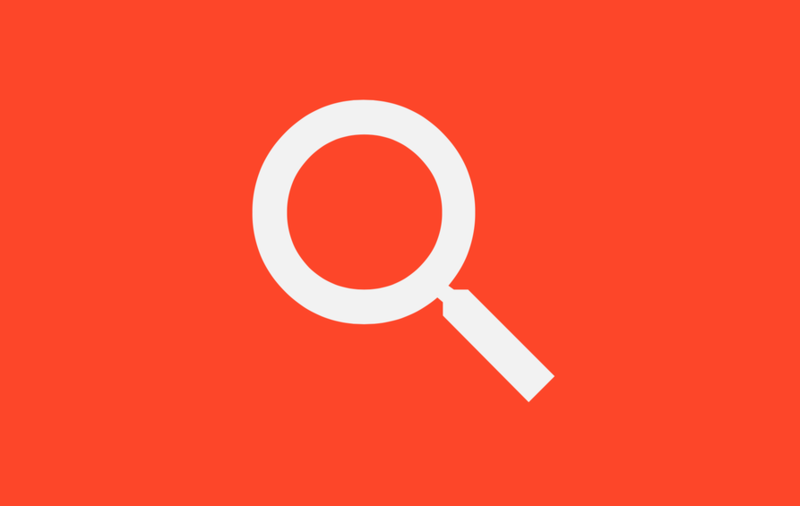 A powerful and flexible search feature that provides relevant results – fast. We also know that offering a search function is more likely to result in conversions. According to Econsultancy findings, conversion rates for online retailers can nearly double – from an average 2.77% to 4.63% – when people who use on-site search find what they're looking for. MAC's old search stats pointed to a similar increase. But whilst it's important to offer site search to users, we also need to ensure that it works well for the search terms people actually use. A great exercise is to regularly review what people are searching for on your site, then search for this yourself and see what results are being returned. You may get some unexpected results! Conversion rates for online retailers can nearly double when people who use on-site search find what they're looking for. Looking back at the two user interactions – people who know exactly what they’re looking for and people who want to browse – offering both keyword search and filtering means we can cater really well for the vast majority users. We thought carefully about the default state of this search. More than half of the top ten searches on the site are for course ‘type’ (e.g. Yoga, Pottery, Animation) – so before even searching for anything, the user is presented with a grid of course types. These are simply pre-selects of the ‘Choose a subject’ dropdown above. It's important to present the right number of filters and options compared to the size your data-set. For example, having 5 filters but only 30 courses means that as soon as you use more than one filter, you're likely to end up with ‘no results’. And that is much more frustrating to users than being presented with lots of results. With the new course finder, not only are we presenting the optimal number of filters – but we actively remove options that are rendered 'unselectable' by what users have filtered by so far. This makes it even less likely that users will get ‘no results’. The keyword search is predictive, so begins to offer results almost as soon as you start typing, which saves the user time. Yes, only a split second but as we’ll come on to, the smallest time saving can make a big difference to conversion rates. Based on user feedback via MAC and data on how people used the old course search, we refined what filters appear; though there may be tweaks to make once users start to interact with it, it’s certainly a very good start. Keywords and filters are constantly updating the page URL. This allows filtered pages to be shared or saved. So for example, the team at MAC can link from a visual arts exhibition page directly to a set of courses filtered to painting, for example. And users can bookmark a particular set of results, based on their choice of keywords/filters. We know that speed and performance directly impact site conversions, so building a speedy search was really important. Google returns results in less than a second – searching “courses at MAC” took three quarters of a second, or 750 milliseconds. We’re returning any search filter on the MAC course finder within an average of 5ms, which not only beats Google for speed but is literally faster than the blink of an eye. The secret is making use of existing technology, rather than trying to build our own powerful search from scratch. We use Algolia, a cloud based search product. It is a paid-for service, but has a very generous free tier available to not-for-profits, like MAC. Algolia sits separately from Spektrix and the website's content management system, so we run logic that updates on-sale status, availability, past events and courses. 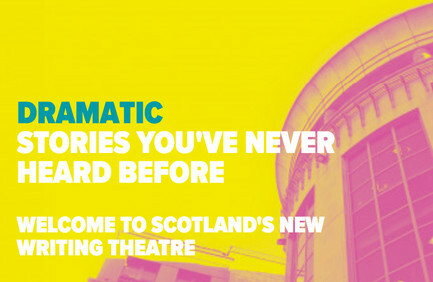 All of this happens without adding load to either the website or Spektrix – which is great when we're managing large on-sales. The result is a search and filter that responds instantly. It’s this live response that changes how users interact with the search; ultimately encouraging exploration and allowing people to search and browse in a way that suits them. Consider your website’s search functionality. Don’t take it for granted, and think about how search can help support your goals – and those of your users. Test your search. Make sure you’re providing relevant results, and curated landing pages for the top keyword searches on your website. Design for the 80%. A brilliant experience for most people is better than everyone’s experience being just ‘okay’. Prioritise speed. 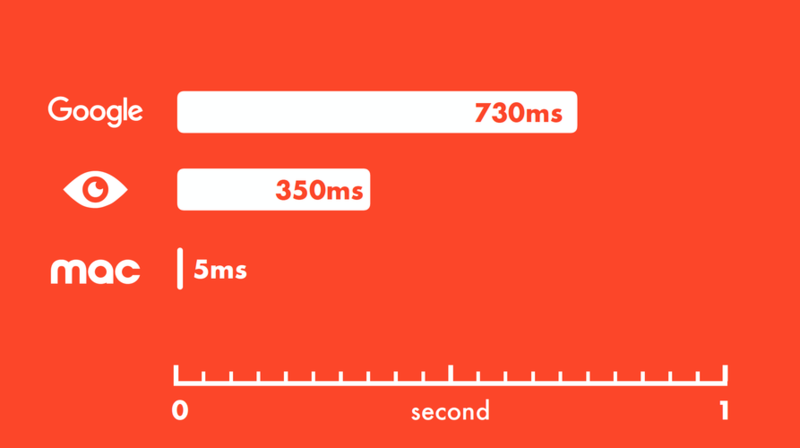 Milliseconds make the difference between an engaged user and an Exit Page statistic. Make the most of existing technology. Don’t build what you don’t have to! Focus your resources on solving other challenges, and refining your audience's online experience. If you want to find out more about the project, feel free to get in touch.